€85.72 Special Price! Save until stocks last. 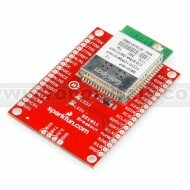 This is a breakout for the GS1011 ultra low-power wireless chip from GainSpan. The GS1011 device is a highly integrated ultra low power wireless single chip which contains an 802.11b radio, media access controller (MAC) and baseband processor, on-chip flash memory and SRAM, and an applications processor all on a single package. Along with its embedded software stack it offers a highly scalable, reliable, manageable and secure wireless link to meet the growing demand of wireless sensor networks utilizing the broadly accepted IEEE 802.11b,g,n standards infrastructure.